Microsoft has a new logo. Gone is the wavy window like squares and 80′s italicized font. Now there are four 2D coloured squares. It is like its Metro UI which they say is “Modern UI design.” Lets see if this new identity helps Microsoft with its shrinking market share. 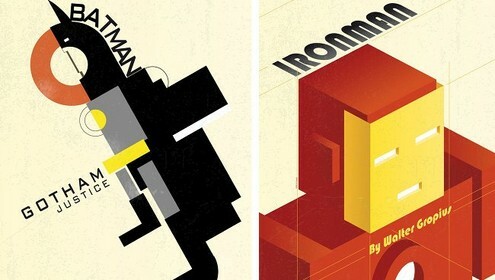 London designer Anneke Short has come up with some great designer posters. 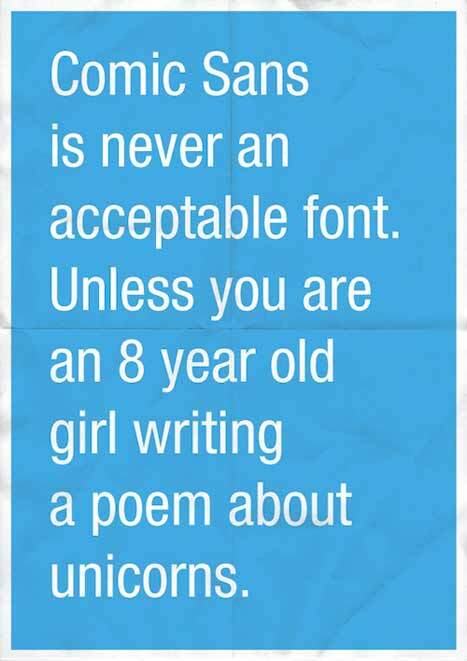 The collection ‘Confessions of a Designer’ is a great collection of quotes! 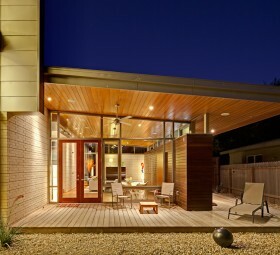 This coming Saturday February 4, 2012 from 11am-6pm is the Modern Home Tour. The homes are designed by local Architects and Designers. The tickets are $20 in advance and $25 on the day. We will see how it compares with the AIA Austin Homes Tour. You can now love colour and support a worthy cause. Gildden Paint is auctioning off shades of colour for charity. A $2 donation to UNICEF gives you the ability to own a colour! There are also some nice real-time info graphics that show shades by gender etc. 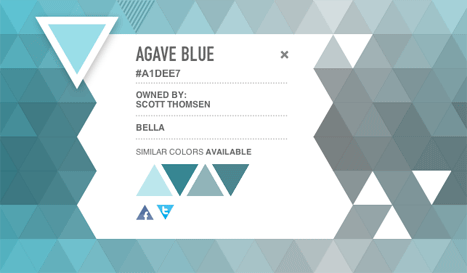 Watch out Tiffanys your blue looks like it might be infringing on Agave Blue! A shout out to Eric over there at Sony for getting us the “Real 3D.” It is not often that you find a 3D version of logo made into an action figure! French Illustrator Greg-Guillemin has taken a modernist slant to the comics. They are quite good. Check them out. As I sat in the Apple Store waiting for my appointment at the Genius Bar, I observed the throngs of people buying and playing with all things Apple. The shopping mall was empty but this store must have had 200 people in it. These people were not technology elitists but kids, grandparents and even people that looked like extras from Jersey Shore. This was a Tuesday at 3PM! For years I had “fought for the mac” and bemoaned Apple’s slide in market share or the Wintel lock on the computer industry. Now Apple had arrived and was a household name. Brilliant, visionary design was accessible to the masses. William Morris’ dream of affordable design for the common man had become a reality. I grumbled slightly because I was 10 minutes past my scheduled appointment and my elite club as a Mac user was not so elite any more. Success has brought some drawbacks that I needed to live with. Then I got the news. There is a song by Baz Luhrmann called Everybody’s Free (To Wear Sunscreen). A line in the song says…”The real troubles in your life are apt to be things that never crossed your worried mind; the kind that blindside you at 4pm on some idle Tuesday.” Well it was a Wednesday not a Tuesday. 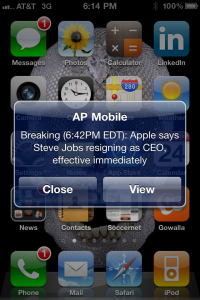 Steve Jobs was stepping down as CEO of Apple. Whatever Steve has, has taken its toll and he can no longer perform his duties of CEO. The guy that brought us the Mac, ipod, iphone, ipad and brilliant, visionary, revolutionary design is sick and can no longer perform his duties. This after he just recently announced his plan for a fantastic new headquarters in Cupertino. Get well Mr. Jobs. The design world misses you already. 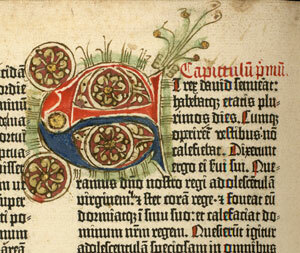 On August 24, 1456, the Bible was printed for the first time in Johann Gutenberg’s shop in Mainz, Germany. Where this date came from no one knows. Most scholars agree that it was completed in 1455 and it took several years to produce. 180 copies of the book were created and the University of Texas has one of five that are in the United States. Regardless of when the book was actually created it should be celebrated. How about today! The USPS has created stamps honoring 12 of the nation’s most influential industrial designers. 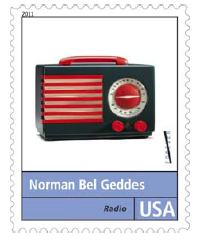 Norman Bel Geddes designed the “Patriot” radio that featured a red-and-white grille that looks kind of like the stripes on the American flag. It can be seen on his stamp.